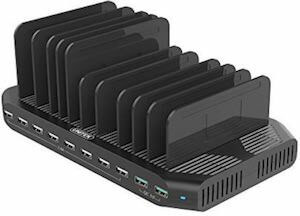 Now you can use this 10 Device Charger that can hold up to 10 devices and charge them all at once. The pockets to stand your device in are moveable to make the perfect size pocket for your device. And there are 8 normal USB ports and two quick charge ports. A stand like this is great for at home but also for school, work, or maybe even the library as now you can park all your devices at night and have them all fully charged ready to go in the morning. No more need for 10 power sockets and lots of space because this can hold it all neatly organized and only needing one power socket. So if you have a need to organize then check out this 10 Device Charger.